Celáre lockers are available in a variety of design styles and are paired with state of the art keyless locks by Digilock. The Celare door creations are available in glass and metal in a variety of designs and colour to suit any décor. 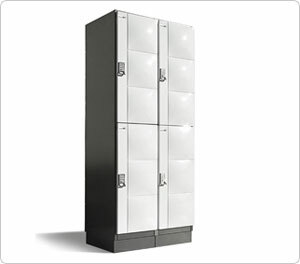 Locker configurations can be designed to accommodate one to six tiers within a single frame. Combines beauty with precision engineering. Functional frames with architecturally sleek doors. Materials meet the latest sustainability standards & are 100% recyclable. Engineered to meet remodelling needs easily. Celare can change its look with it with a simple door refresh. Frames are universal and doors can be reordered and installed quickly and effortlessly. Euro soft-close hinges and sound dampening system reduces locker room noise to ensure guest comfort. A comprehensive ventilation system that spans a full 72″ to provide true vertical airflow. Constructed to withstand heavy use in demanding environments. The Celáre door creations are available in Enamel Glazed Galvanized Steel and Sleek Tempered Safety Glass in a variety of colours for a complete custom design. Available in one to six tiers within a single frame in single, double and triple widths. 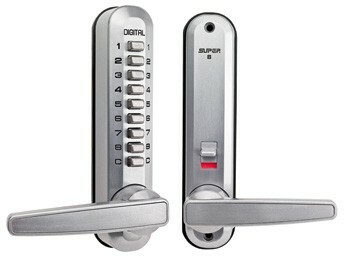 Exclusively secured by Digilock, the industry leader in electronic locking solutions. Digilock provides the ideal level of security for guests’ storage needs by making Security Simple. Through the synthesis of innovative technology with the highest calibre of materials, Digilock is able to provide products that perform. Available in an array of designs, styles and functions suitable for any décor.